Smoke from fires along the waterfront cover the New Orleans skyline in September. NEW ORLEANS, Louisiana (Reuters) -- The drivers of Strike Team Two, a gypsy water convoy battle-hardened from fighting Western wildfires, sleep in a tent on the fringe of New Orleans and wait for orders to roll out the pumpkins. As part of an experiment in applying backwoods fire-fighting tactics to the urban wilderness, New Orleans' fire department has turned to grizzled U.S. Forest Service contractors to help keep the wreckage left by Hurricane Katrina from going up in flames. "The more uncivilized it got here, the more we fit in," said Rob Bozeman of Boulder, Colorado, laughing. The team brought six water tanker trucks to douse blazes in New Orleans' still largely uninhabited eastern edge. Their two "pumpkins" are reddish collapsible tanks that can be put anywhere and pumped full of water, each creating a near-instant reservoir of 2,500 gallons in areas without working hydrants. Large patches of New Orleans are still without running water, and entire neighborhoods all but deserted. That's where the contractors step in. The result has been a collision of cultures, as city firefighters used to overpowering fires confront the need to conserve water and accept that the best result is often simply containing a blaze -- accepted wisdom in the wilderness. "It's a total difference in the way you fight fires," said New Orleans Fire Department Captain Tom Hawley said. "You can't just throw water around like we used to." Two pumpkins -- also known as porta-ponds -- give New Orleans firefighters about three to four minutes of water capacity in a fire, Hawley said. The tanker trucks then peel off to the nearest working hydrant to refill with a special pump arranged by Hawley. In one fire, the convoy delivered 60,000 gallons, said Greg Nichols, who rides with Bozeman in a lime-green tanker dubbed "Fire Water." 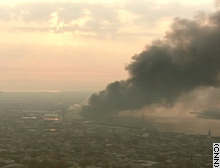 Since Katrina, the teams have been called out on about 35 fires in New Orleans, but that is fewer than initially feared. Officials had been concerned about the risk of arson in neighborhoods still lacking gas and electricity. "I don't think we've ever had the urban involvement that we've had with this year's hurricanes," said Rose Davis, spokeswoman for the Boise, Idaho-based National Interagency Fire Center, which coordinated the New Orleans reinforcements. That also includes two water-ferrying helicopters capable of picking up 3,000 gallons from pools or ponds for water drops capable of crushing a burning house. "That will squash you like a bug," Hawley said. Acknowledging their power, New Orleans fire crews have dubbed the choppers "Voodoo Command." Strike Team Two shares its suburban parking lot base camp with a row of police cars trashed by flooding. The mosquitoes are thick, but no one is complaining. There are occasional runs to a nearby store, a stack of DVDs and an old TV rigged up on a folding table. "We're not half as bad off as we would be if we were in a wildland fire," Nichols said. Two of the tankers made the five-day drive to New Orleans from Montana. The nearest came from northern Michigan. All say they will stay as long as they are needed, but no one has a clear idea when city water will return, so New Orleans will be safe without the the pumpkins and Voodoo. "I'll stay until they give me my papers," said Brian Zimmerman of Libby, Montana.